Use The Open Enrollment Module to grow your customer database. Open enrollment makes it easier for unknown customers to register, leading to better marketing strategies. Want to open up incentive program possibilities with open enrollment? The Open Enrollment Module helps you fill in gaps of missing info in your customer database. One of the biggest challenges facing today’s marketers is acquiring accurate, up-to-date customer data. If you go to market through a distribution channel, you probably have an incomplete customer database, as many of your end-users only interact with your channel partners. With the Open Enrollment Module online registration form, anyone can sign up for your program. Because they’re signing up for great incentive reward opportunities, your program participants have the motivation to give you something you desperately need: customer data! You can then use this valuable marketing data to improve marketing strategies, increase sales and provide the return on investment you expect from your loyalty program. What are the features and benefits of The Open Enrollment Module? Allow anyone to sign up for your incentive program through an online registration form. Customize your participant enrollment form to capture the customer data you want. Capture previously unknown data to refine your customer database. Learn more about your target demographic to improve marketing strategies. Which types of incentive programs should use The Open Enrollment Module? The Open Enrollment Module allows you to enhance your customer database with clean, current information, which improves your marketing strategies. 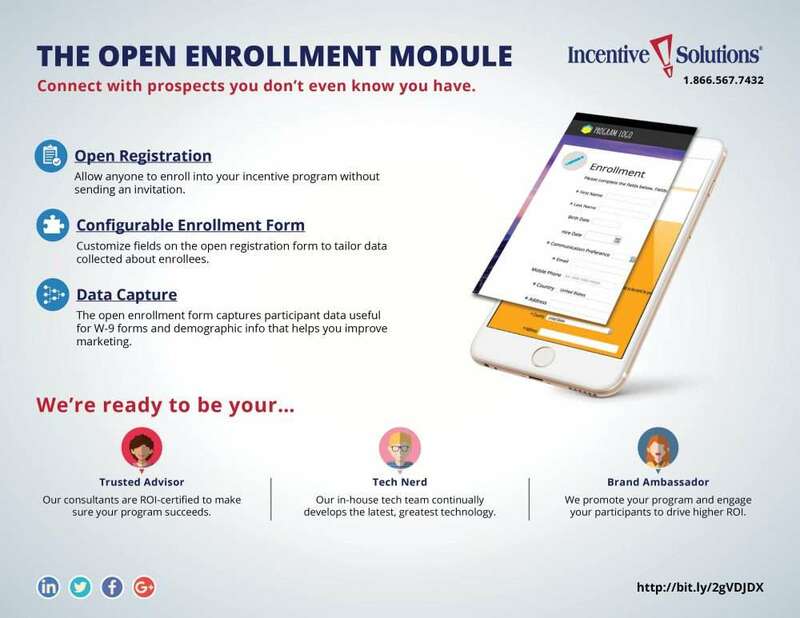 With The Open Enrollment Module, you can gain customer data from previously unknown dealers, distributors and contractors and market to them. Get the most out of The Open Enrollment Module by pairing it with these other modules. Integrate your loyalty program with your existing corporate website and provide a link straight to your open enrollment form for maximum convenience. Learn more! This module allows you to assign different incentive program access and controls to varying members of your org chart. You can limit manager access to only the enrollment data that pertains to their department, organization, region or team. Learn More! Feed data from incentive program enrollment into your customer relationship management (CRM) system. Learn more! With the Gamification Module, participants can spin a virtual “wheel of fortune” on enrollment to win reward points. Winning points right off the bat motivates participants to stay active in your program! Learn more! Allow participants to instantly sign up for your program on the spot, wherever they are.